Visit Sweden and within a day you’ll hear, or see, the word ‘fika’ (pronounced feeka). You might be tempted to think fika is a food; a sandwich perhaps, advertised as a daily special on chalkboard signs standing guard outside one of the city’s numerous cafes. The truth is the word ‘fika’ doesn’t have a direct translation in English. The closest one can get to a direct translation is ‘coffee break’ usually with something to eat, but that doesn’t quite do the word, or the concept, justice. Today, I’m going to try and explain this social institution for all the non-Swedes out there, and guess what? I’ve drawn pictures! With stick figures! You are going to love them :). Trust me, by the end of the post you’ll want to commission me. When two or more people gather together to share coffee (other beverages, such as tea, are allowed), pastries (cinnamon buns, chocolate balls, cake, bread, sandwiches, or fruit. You know what? Let’s go with ‘share a bite to eat’), and companionship. Do I have to talk to someone? No need to look at each other when you speak. Heck no! Face-to-face chatting is so overrated. 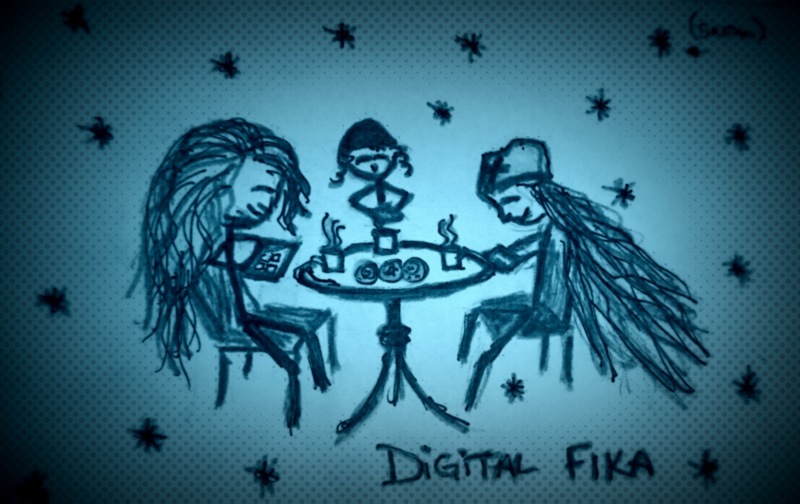 Introducing, Digital Fika! Enjoy the fellowship of your friends, without ever opening your mouth. All you need is an electronic device and a finger. Or a stylus, I guess (do they still make those?). Ipad, smart phones, tablets, notebooks, or other devices where you can access social media sites are encouraged. You’ll also need access to the latest chat apps. It’s my understanding LOLs are permitted. Don’t let the social police stop you. If you want to fika in your bathroom, go for it! You can fika anywhere! 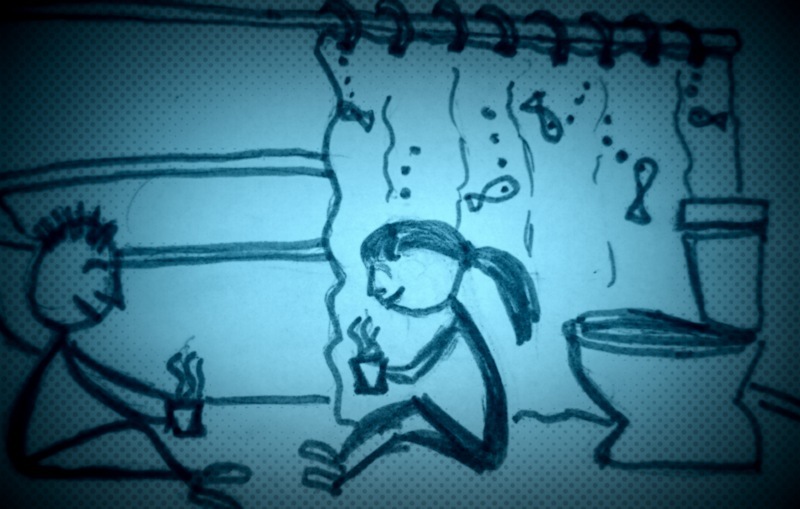 The beach, a friend’s house, the bathroom, no place is off limits. Wait, so fika is a verb and a noun? I know, crazy, right? 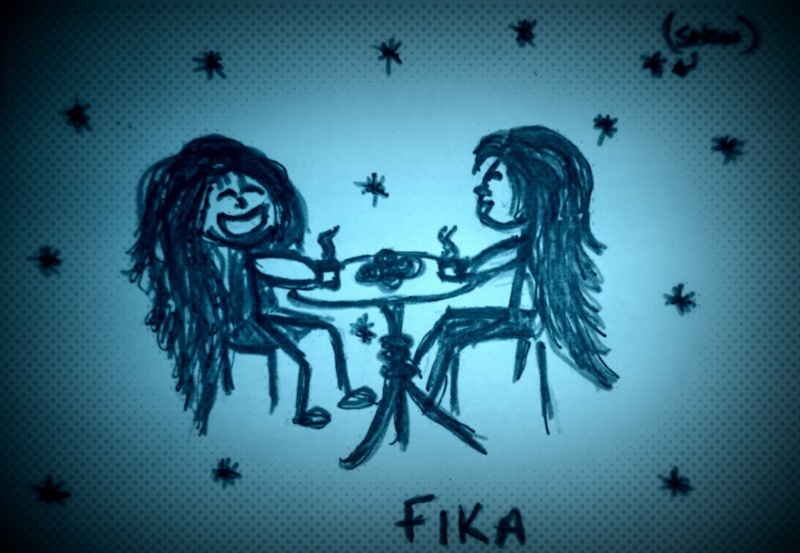 You can ‘ta en fika’ (take a fika), fika (the act of fika-ing), or ‘ha fika’ (have fika). The short answer: whenever they want. At work. Many companies have set fika times. My husband’s company has Friday Fika. At a scheduled time in the afternoon, everyone stops whatever they’re doing and they come together to enjoy something to eat and coffee. I’ve heard some companies have fika every day. Whenever our relatives visit, or we visit them, we fika. We fika on name days. In Sweden, each day is associated with a specific name. If it’s your name day, we have a special fika. Well, I say ‘we’ as if I actually do it, which I don’t, and I say ‘you’ as if I know what your name is, which I don’t. We (this time meaning me and my family) should. Kids love it. The problem is I have a terrible memory and I always forget. Then I look at the calendar and realize, Oh crap, I missed her name day, again! But many folks are better organized than me and actually do fika on name days, so it’s safe for me to write that. According to the Behind the Name website, if your name is Fabian or Sebastian, you’re up. Ta en fika killar. We fika to catch up with friends. Most of our friends have children and trying to coordinate our bedtime, their bedtime, allergies, prime temper tantrum times, outbursts because the food isn’t shaped like circles, and making sure nobody has snot falling out their nose makes it difficult to schedule the type of events people with small children rarely experience, like enjoying a nice dinner with other adults. Fika becomes an alternative until the kids are old enough to . . . well, until they’re old enough to do their own thing. 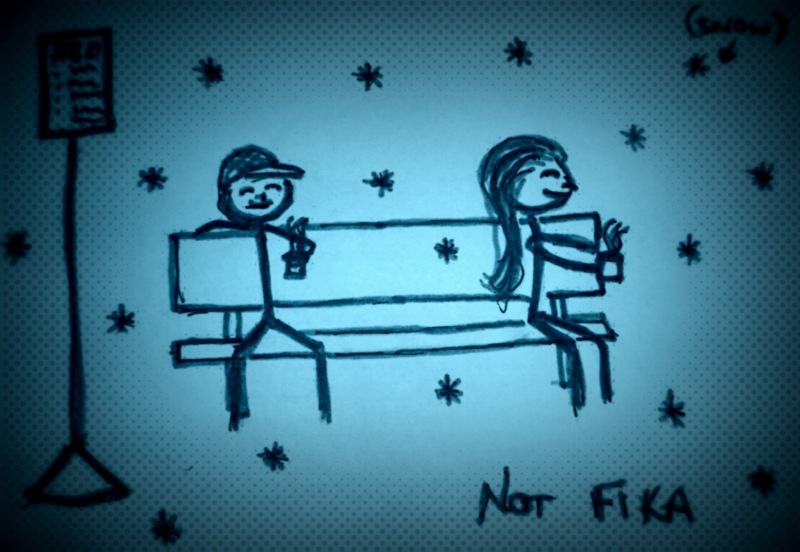 Some people fika as a ‘pre-date’. Say, for example, they want to meet up with someone they are interested in without experiencing the pressure of an actual date. Swedes are very calm people. They don’t like pressure. My husband and I fika almost every night after the kids fall asleep. So, let me get this straight. As long as I drink coffee with someone else, it’s a fika? Swedes waiting for the bus. Nope. Drinking coffee together in the same place and at the same time doesn’t mean you’re having fika. This is the part I think people misunderstand. I’ve had coffee breaks with other people. When I worked at the newspaper in California, we’d sit around the break room together. A few rebellious people who thought sitting was out-dated leaned against the counter. We drank coffee. In the same room together. We knew each other. Occasionally, one of us might say something profound like, ‘pass the sugar.’ We were not enjoying a fika. One of the key elements of fika is sharing companionship. Without that, you’re just taking a coffee break. Or a tea break. Or whatever. Thanks, but no thanks. I’m a busy person. Besides, I don’t like people. NO! I can’t believe you just said that. Take it back. Turning down a fika is one of the gravest sins you can commit in Swedish society. It probably falls right under, ‘Make small talk with a stranger.’ It might also be close to, ‘Say anything disparaging about IKEA.’ Here’s my advice, don’t do it! (Not the speaking to someone thing. Do that. If you want. The IKEA thing could go either way). If a Swede invites you to fika, that’s something special. She’s invited you to share more than a cup of coffee. She’s invited you to share a piece of the day with her. And she (or he) has offered to share a piece of herself with you. You should never turn that down. There ya go, fika in a nutshell. I don’t know about you, but all this talk about coffee has made me thirsty. Time for me to find a friend and go fika. Wish we could fika. Oh, I know. Maybe we can virtual fika one day! haha, you might be right! We went to IKEA on Sunday and a group of employees were standing there talking to each other. They weren’t helping any customers. When I asked if I could ask a question, two of them wanted to know where my number slip was. Sometimes I secretly want to see into the future and spy on them when they go to other countries. Do they get stuck at the ice cream shop in Italy because they’re wandering around looking for the queue machine?